Being part of the Massachusetts state organization for manufactured homeowners, I’d been able to see across the state how much better these communities were, from face value it looked good, people were happier. I knew it was something we want to go for in our community if we had the chance. We have a law in Massachusetts that makes it pretty easy for residents to compete to be able to purchase their community. It’s a complex law that governs most of the aspect of purchasing. If the owner wants to sell they have to notify residents, and if the residents are organized into an HOA and over 51% vote to purchase they have 45 days to make an offer. If the offer matches any other offers, the owner has to accept it. In my community, we always thought if we can choose our own destiny, have control of our own land, why not. It took myself and other leaders in my community three tries to successfully buy our community, but on the third try we got it. The first time, residents had to come up with $10,000/lot in order to get the loan. We were able to get 53% to put down $10,000, but the bank wanted a larger percentage so they turned us down. The second time, residents voted it down, because they were worried about what it would be like to have residents running the community, to have some residents dictating to others. However, by the third time, there had been so many rent increases that more residents agreed it was the right route and we were able to work with ROC USA to secure financing. It was a long process, but in the end, it paid off. As a resident, you pay top dollar to purchase the community, because there are so many predatory buyers out there that want to squeeze you to death. So, you have to match their price. It’s important to make sure you have a negotiator you trust to close the deal who will keep everyone up to date on everything. It’s important to keep all the residents informed at each step of the process. When we purchased five years ago our rent was $245 and now it’s $383. We borrowed $2.7 million to purchase the community and another $1.8 million for infrastructure work that needed to be done. I ended up being in charge of the infrastructure work, securing the contractors and managing the project. We got most of it done in only eight months, and saved a lot of money. It was nice to be in charge of that, to be able to make sure the work was done well and that we got a good price for the work. I’ve seen the change that comes out in people once we became a resident owned community, the pride that people take in their homes now, in the community. Everyone has really tried hard to work together. Sometimes human nature can get in the way, people give in to name calling or thinking they are the only ones who know what to do. Some people can become very cliquish, that happens everywhere. We wanted to pre-empt any problems like this so we made sure to put term limits on the board, no more than two consecutive terms. That was a good thing to stop the power struggle, to make sure there was accountability and everyone in the community had a voice. 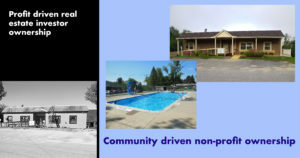 Running a cooperatively owned manufactured home community is similar to doing any community work. You have to listen to the people you’re talking to more than you are talking yourself. You can’t please everybody, there will always be a small group that disagrees, so you have to develop a thick skin. But you do the work, and help create the vision, and show everyone what can be done to improve the community for all residents. It is a lot of work to run the cooperative, particularly at the beginning, that’s something to keep in mind. The truth is its difficult, but rewarding. The first two years it was like a full-time job, it is running a multi-million-dollar business so it’s a lot of work. That can be a challenge when you have an unpaid board. It can be a good idea to put money into the budget to hire one or two people to work as staff instead of as board members. I would say though that in every community there is the leadership it takes to be able to do this, to run a community. In all the communities, I’ve worked with in Massachusetts, I’ve never been to a community that didn’t have good leadership. Despite all the work, it’s good to own there is no question about it. Residents are relieved because they know they’re a part of it, they know where all of their money is going. You can make it more efficient, because the predatory owner is only looking to do a minimum of infrastructure work or maintenance. As a cooperative owner, you can look at the long term, look at what the residents really want. It’s hard work, and it’s not perfect, but I think there is no better way of going other than a resident owned community. I’d be happy to talk with anyone who wants to start thinking about this, you can reach out to MHAction to get in touch with me. It’s important to go into this process with your eyes wide open, if you know what to look for and what to expect up front it will be a smoother process.